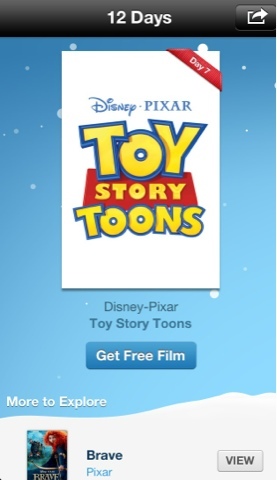 It's Day 12 of Apple's 12 Days of Christmas promo and we have a good one today: Toy Story Toons. It's some short movies from Pixar'd Toy Story. At the US iTunes store this retails for $2.99 per short and Apple's giving away two titles: Small fry and Hawaiian Vacation. If you love Toy Story 3, these shorts are worth downloading.